Matilda, Queen of Germany and wife of King Henry I was the daughter of Count Dietrich of Westphalia and Reinhild of Denmark. She was born about 895 and was raised by her grandmother, the Abbess of Eufurt convent. Matilda married Henry the Fowler, son of Duke Otto of Saxony, in the year 909. He succeeded his father as Duke in the year 912 and in 919 succeeded King Conrad I to the German throne. She was widowed in the year 936, and supported her son Henry's claim to his father's throne. When her son Otto (the Great) was elected, she persuaded him to name Henry Duke of Bavaria after he led an unsuccessful revolt. 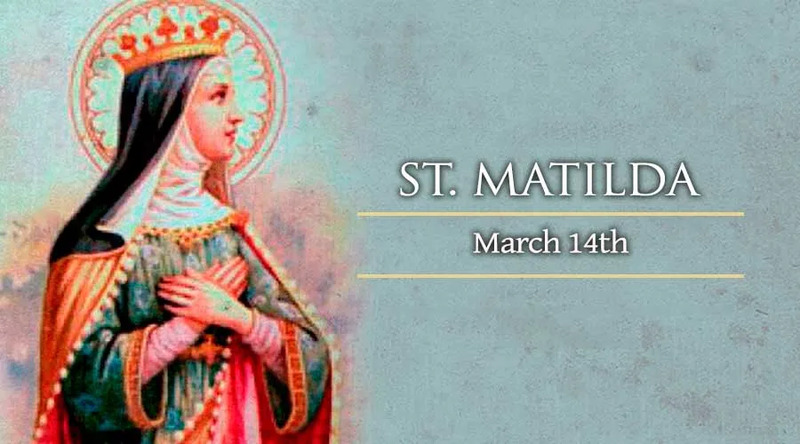 St Matilda was known for her considerable almsgiving. She was severely criticized by both Otto and Henry for what they considered her extravagant gifts to charities. As a result, she resigned her inheritance to her sons and retired to her country home. She was later recalled to the court through the intercession of Otto's wife, Edith. Matilda was welcomed back to the palace and her sons asked for her forgiveness. In her final years, she devoted herself to the building of many churches, convents and monasteries. She spent most of the declining years of her life at the convent at Nordhausen she had built. She died at the monastery at Quedlinburg on March 14 and was buried there with her late husband, Henry.